The international growth scourge spreads its wings in January. Japan’s yen based exports fell by 6.6% in January as imports declined by 4.2% driving the trade balance to -¥370bn. It is the largest monthly deficit since February of 2015. Slow growth in China was a big part of this result as Japan's exports to China plunged 17.4 per cent year-on-year in January. China is Japan’s largest trade partner followed by the US. Japan’s exports decline over 3-months 6-months and 12-months. Japan’s imports decline over 3-months and 6-months and rise by 1% over 12-months. These are weak metrics. The yen has been relatively stable over the period and has not had a major influence on trade flows. Contributing to nominal trade flow weakness Japan’s export and import prices have been falling steadily. Export prices are down by 3.3% over 12-months while import prices are down by 1.7%. We can attribute some of this weakness especially on the import side to weak oil prices. Over 3-months exports prices are falling at an annual rate of 20% while import prices are falling at an annual rate of 30%. But real trade flows are weak too; weakness in nominal trade flows is by no means only a nominal event. Real exports are extremely weak. Export volume fell by 4.8% month-to-month in January when import volume fell month-to-month by 0.6%. Over three-months export volume has fallen at a 22% annual rate while import volume is falling at an 8.6% annual rate. Export volume falls over 6-months and 12-months as well while import volumes rise on those two horizons. Japan’s economy is not strong. Still, it appears that Japan’s domestic demand is holding up better than demand in Japan’s trade-weighted markets. Since growth in the US has been relatively steady, this points a finger at China where we know conditions are slowing and where official figures are never fully to be trusted. China has been an enigma for international analysis. It has been a bulwark of growth in some ways, but has engaged in many anti-competitive practices that US is now trying to get its arms around and stop. For years China’s practices were accepted as part of a close-enough to ‘free trade’ system even though that was never even close to true. It was only after America’s situation was so dire that the electorate threw out traditional political candidates to elect an outsider as president that economists began to re-evaluate their analysis of China’s trade and world trade as being close enough to free trade. China’s new Belt and Road strategy is another step in China’s efforts to spread its influence and financial control over smaller countries. In fact a NY Time articles (here) about a dam project China executed in Ecuador – a project that does not work - will still STILL cost Ecuador 80% of its oil revenues is an example of China’s willingness to bribe local officials and exploit small nations. China has been master at politics using its size well and the selling the potential of China for a trade and direct investment. China has used its size is to exploit foreign investment and yet has managed to get the benefit of development lending from the World Bank, as a still developing nation itself…even as it set up its own regional development bank. But that is about to stop with a new head of the World Bank appointed. For all the disdain Trump gets at home for his focus on "the wall" and his battles with Democrats and the ongoing Russia investigation his pressure on China for a real trade deal is a real breath of fresh air that no other US president ever tried or even appreciated. His success in trade negotiations is yet to be determined. So the jury is still out on this one. Japan’s poor trade figures can’t help but to divert attention to China and to raise questions about how well it really is doing. Japan is still a very important economy in world trade but China is now where all the attention is directed and anything that sheds light on how it is doing is useful. As a rule of thumb I would expect that the worse China is doing the better chance Trump has of getting the kind of trade deal he wants. 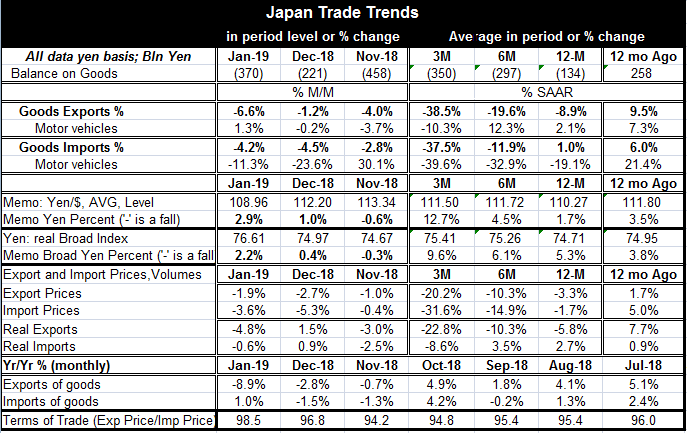 Japan’s trade data make it look as though the Trump trade negotiators sit in the cat bird’s seat right now. We’ll see.